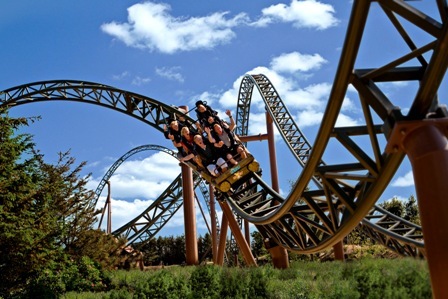 Everyone in both boys’ and girls’ classes participating in Nørhalne Cup is given the chance to spend a few hours at Fårup Sommerland, which is one of Denmark’s most successful amusement parks and where all the rides are free once the admission price has been paid. Two types of participant cards, A and B, are available, and the B card includes admission to Fårup Sommerland. Once the final deadline for entry has passed, we will forward a number of forms that have to be completed. Among these is the option of booking a tournament bus for transport to and from Fårup Sommerland or football golf. If a team can see in their tournament schedule that there is sufficient time to play a round or two of football golf, or if you arrive early or are not due to depart until somewhat later in the day on Sunday, then this is a great chance to visit Nørhalne’s football golf course. We can help you in terms of booking a time and arranging transport. We can also be contacted on +45 9826 8675 during the tournament if you decide to take advantage of this opportunity. Our Elite teams purchase an E card and their tournament schedule does not normally enable them to visit either of the above attractions, but should they find that there is time available, they are very welcome to contact the Information service in Nørhalne during the tournament in order to sort out a visit to Fårup Sommerland or football golf.